Hi. I do not knit. 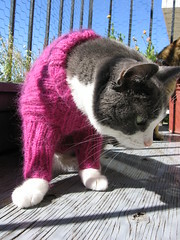 Do you have a pattern to use to sew a fleece cat jacket or sweater? Thank you. I just book marked your blog http://www.christinelandry.com on Digg and Stumble Upon. I enjoy reading your commentaries. hahahaha! Love it! One of my cats needs to be shaved. I will have to make this for her, though I don’t have high hopes of her wearing it much longer than a minute or two.Thanks for the laughs! 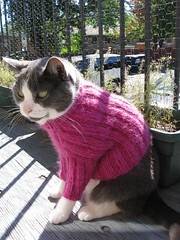 I got as much enjoyment out of reading the comments as I did of the sweatered kitties! Thank you for an entertaining break from my boring job!! 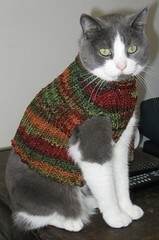 I’d love to make a sweater for my cat but I can’t knit. I even went as far as to search for them for sale on ebay!! LOL Again, thanks for the laughs! I don’t knit…wish I could! I just wanted to comment that I have a kitty who LOVES to wear sweaters!I think he just knows how cute he looks. I made some from old sweaters but I don’t leave them on him because he’s 17 and has a little arthritis and don’t want him to try to wiggle out and get tripped up if I’m not there. But I think he’d wear them all the time if I let him! Thanks so much for this pattern!! This is the best one I have found yet! Im working on making several up, and see about selling them, donating a percentage to a cat rescue. Will you be ok with me doing this? Please let me know by email. t.sweetwood @ yahoo.com. Also, to the cat rescue person who posted a need for a couple of sweaters, I know the request was made some time ago, but if you are still out there, email me. Just starting one this week…it seems obvious, but when I finish the divide for arms section, chest piece, bind off? or slip onto a holder?Reading on…I guess this section will be joined to the back to create the neck opening…I’ll just forge on…and I absolutely hate to have to undo stitches! How did you get that cat to wear it my boys wouldn’t be impressed! 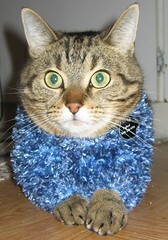 I have threatened my catPercy that I would make him a coat he wont wear a collar and takes it off. The last collar was found in the pond! Thank you for sharing this pattern! It’s so cute. I posted pictures on Ravelry.